Have you ever decided to engrave logo design on wood? if not then you can try this mockup and have a good feel of how a logo design will look on plain wood. 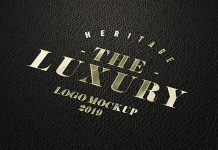 For logo designers it is always preferred to present new logo designs on a logo mockup either it is on wood, steel, paper, card or cloth. Let your clients get more excited to see their new logo design on this wooden mockup and to there will be a a good chance for designer to find early approval.